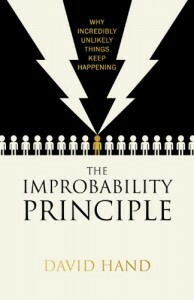 The ideas and anomalies discussed in this web site can be investigated further by reading Professor Hand’s new book ‘The Improbability Principle’ (US edition). (click here for UK edition). Why is it that incredibly unlikely phenomena actually happen quite regularly and why should we, in fact, expect such things to happen? 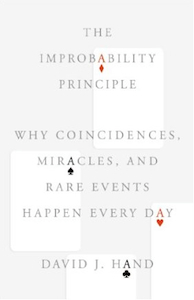 Here, in this highly original book – aimed squarely at anyone with an interest in coincidences, probability or gambling – eminent statistician David Hand answers this question by weaving together various strands of probability into a unified explanation, which he calls the improbability principle. In my experience, it is very rare to find a book that is both erudite and entertaining. Yet The Improbability Principle is such a book. Surely this cannot be due to chance alone! Written by one of the world’s preeminent statisticians, The Improbability Principle provides you with a sense of what chance and improbability really mean, and engenders an understanding that uncertainty rests at the core of nature. I highly recommend this book. As someone who happened to meet his future wife on a plane, on an airline he rarely used, I wholeheartedly endorse David Hand’s fascinating guide to improbability, a subject which affects the lives of all, yet until now has lacked a coherent exposition of its underlying principles. The Improbability Principle is an elegant, astoundingly clear, and enjoyable combination of subtle statistical thinking and real-world events. David J. Hand really does explain why ‘surprising’ things will happen and why statistics matters. [An] ingenious introduction to probability that mixes counterintuitive anecdotes with easily digestible doses of statistics . . . Hand offers much food for thought, and readers willing to handle some simple mathematics will find this a delightful addition to the “why people believe weird things” genre. You can purchase your own copy of the book here (for the USA) or here (for the UK). You might also be interested to view the publisher’s (Macmillan/Scientific American) web page about the book here.